LynchyRightNow: Lane, next rounds on me! The same coach who felt no fear filling the shoes of one Phillip Fulmer in Knoxville shows the same stepping into those of So Cal legend, Pete Carroll. Fourteen months after replacing a National Championship winning head coach at Tennessee, the 34-year old Lane Kiffin replaces a 2x National Champion at Southern California and I couldn't be more excited. For these (10) Ten Reasons Lane, next rounds on me! 10. He's as bad as he wants to be. Not only does Lane Kiffin make noise in a conference that fears no one (SEC) but he takes on the best in said conference. From Nick Saban and Urban Meyer to Steve Spurrier, Lane Kiffin refused to "kiss the ring." This is why he is lured by the most prominent program in collegiate athletics. This is the reason why he is in Southern California and not in Knoxville. 9. Lane Kiffin can recruit. The most important thing you can say of any Division 1 collegiate football coach, you can say about Lane Kiffin. The clip they continually show on The World Wide Leader, is one of Kiffin welcoming players into his office. This isn't old Joe Paterno or Bobby Bowden, this is a coach who makes the half handshake/hug look legit. 8. Being 34 is a good thing. When a college football coach attempts luring you with stories of 1956 Heisman winner Paul Hornung, I'm not buying it. Yet when he recites stories of Reggie Bush running wild on the PAC-10 in 2005, I'm a tad more invested. Well, Lane Kiffin knows of Reggie Bush and could care less of Paul Hornung. 7. Front & Center. You can bet the Trojans are football program #1 on his mind. After getting a great gig in Tennessee, it takes a special person to jet for So. Cal under two years later. This is THE job to him. Mentioned more than once in his introduction speech, Lane Kiffin assured Trojan Nation, this is the prominent job in college athletics, and I can't disagree. 6. Maybe his sole year in the SEC wasn't great, but it was entertaining. Yes, you get credit for that. When some coaches are getting axed for being uptight and taking it out on players, Lane Kiffin just gets other coaches all anxious and on edge. The PAC-10 could use that with Jim Harbaugh in Palo Alto, you can bet some sweat is going into work with Kiffin now in conference. 5. Monte. Derrick Brooks, John Lynch and Ronde Barber here's a coach who demanded the best and got it at the highest level. Lane's father, Monte Kiffin, was a long time defensive mastermind in the NFL before helping his son in Knoxville. Do we have any doubt that the new defensive coordinator at USC will be able to put these kids into the professional ranks as more than prepared? 4. If Barkely is ready, so is Southern Cal. You can assure yourself that both Pete Carroll and Lane Kiffin like the same type of athletes. This is exactly why USC true Sophomore quarterback, Matt Barkely is the best fit for Kiffin. In the coming year you'll see a quaterback who fits better in a program than you've ever seen. Lane gets him to where he needs to be. 3. Southern Cal couldn't go forward with peace. The Trojans needed a coach who was just as comfortable with the position as Pete Carroll was. Carroll felt no problems with being on Late Night, he felt no problem with being the biggest football personality in California, this is what Southern Cal. needed. This is what Lane Kiffin is. 2. Ain't Notre Dame. We don't need the championship rings, we don't need the pedigree, we don't need the headlines. What Southern California requires is greater than all that. Cheeks in the seats. Brian Kelly doesn't insite ticket sales, but Lane Kiffin does. At some point a university has to realize that. Southern Cal just did. 1. Because he's Hollywood. Find the guy who argues against it? I can't. 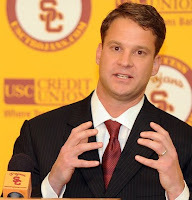 Lane Kiffin is the next coach of USC and I have no contest. We've watched this young an get jobs he doesn't earn, but maybe that's him. His gorgeous wife, his gorgeous children, his famed career. Maybe Lane Kiffin is just bigger than all that. That's why he's the newest Trojan head coach and we love it! Lane Kiffin, next round is on me!